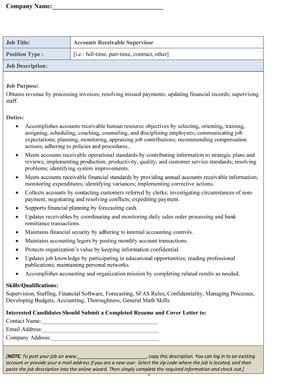 Free Business Job Descriptions are available for your Human Resources Department to download and print 24/7 for managers, bookkeepers, customer service reps and lots more! The job descriptions below for your business are communication tools that are significant in your organization’s success. They clearly identify and spell out the responsibilities of a specific job position. Poorly written job descriptions, on the other hand, add to the workplace confusion, hurts communication, and makes people feel as if they don’t know what is expected of them. and reporting relationships of a particular job. Employee job descriptions create an opportunity for your Human Resource Department to clearly identify and spell out the responsibilities of a specific job. Depending on the size of your organization, you might require staff and managers to cover a wider or more mixed range of responsibilities than those larger organizations. For example, the Office Manager can compromise financial, stock controlling, human resources, scheduling and many other duties. Whatever the circumstances, the job responsibilities should not exceed 15-16 or the job description becomes ineffective. You can also clearly communicate the company direction with job descriptions and also let the employee know exactly where they fit in the big picture. Aligning the possible employees with your company mission, goals and vision will ensure success for your organization. The Head of Business Development job description below can be used as a guide for creating your own description for your small business. This description outlines the key job information, tasks, specifications, compensation and benefits. Feel free to customize to fit your specific organizational needs. Click Here to Access the Free Medical Job Descriptions.